I have always enjoyed cooking. I LOVE making good food for myself and my loved ones. I feel out of balance if I go for too many days without having time to cook a decent meal. I like making things. Sewing is my hobby of choice. I prefer making clothing, mostly for myself, occasionally for my daughter and others. One thing I like about sewing is that I can be creative without being artistic. I also like that I can make things that are useful. I have recently taken up knitting – it fulfills the same creative itch as sewing but is more portable. In my previous life I worked as a software engineer. In 2009 I decided to stop working so I could be a full-time mom to my beautiful, challenging daughter with multiple special needs. That was one of the best decisions I ever made! My husband and I are fledgling vegetable gardeners. 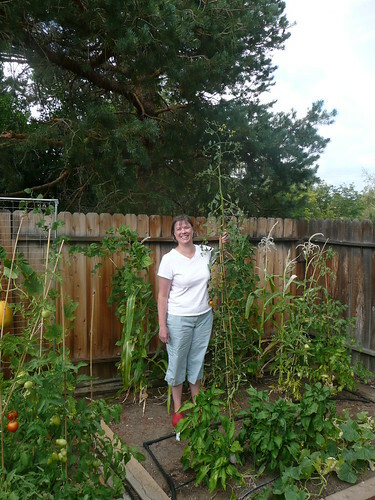 We planted our first garden in Summer 2010 with mixed success and plan on improving every year! Next to my super-tall cherry tomato plant. Yours is a lovely blog with inspirational ideas and photos – thank you for sharing it – would love to hear more about your garden – the successes and challenges – Emma.